Categorized as: Stories on February 1, 2014. Feeling like she’s always running in circles, Anali runs a small weaving microbusiness, studies accounting at university, and cares for her partner and daughter at home. 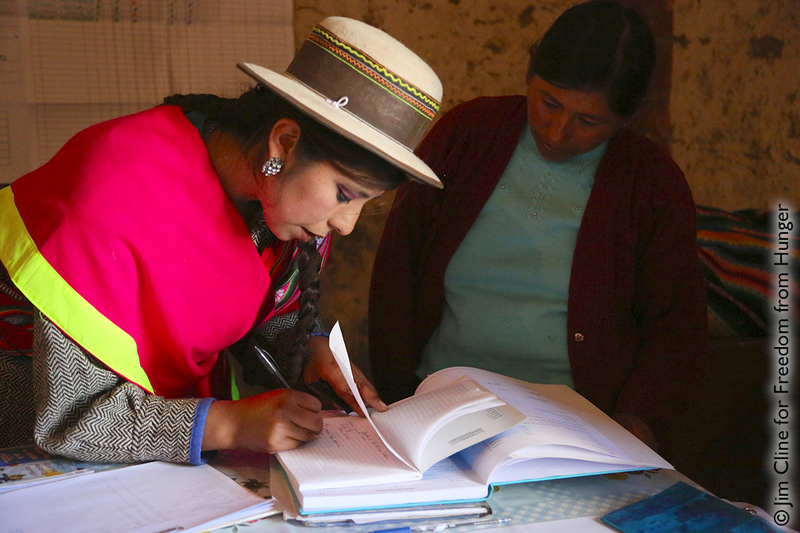 She left a rural village, population 400, in the Andes Mountains to pursue her dreams in the city of Juliaca, and Anali is already banking on a brighter future for herself and her kids. 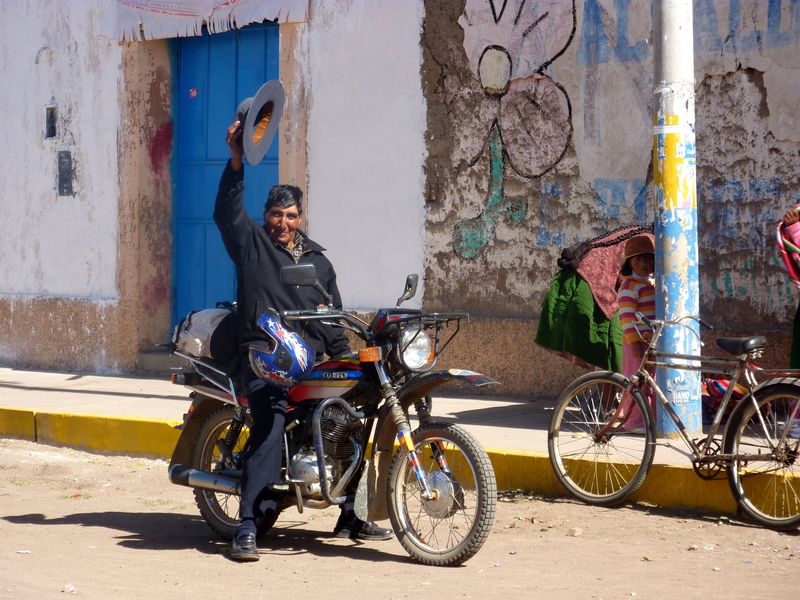 Part 4 in our 5-part series from Peru. Cover photograph: Anali (R) returns once a month to her hometown village of Calapuja Village to attend meetings with her credit group and her grandma (L), who also happens to be the group president. Photograph by Jim Cline for Freedom from Hunger. 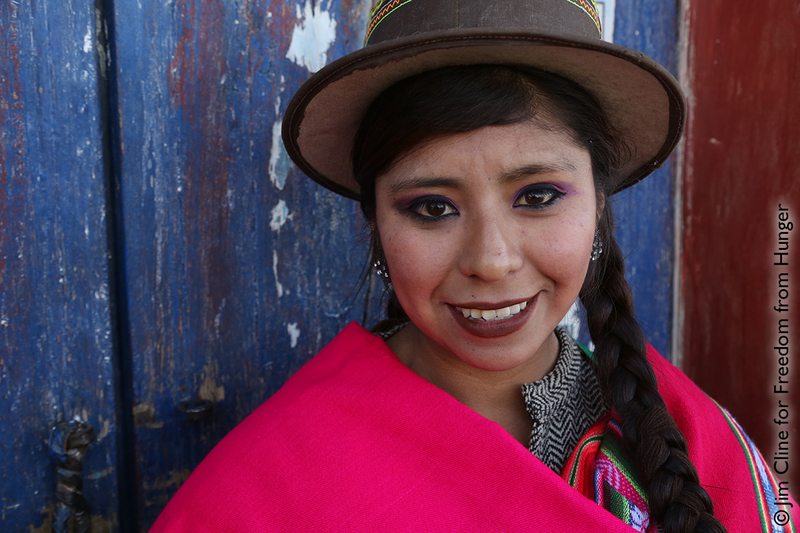 Calapuja Village, Peru: 27-year-old Anali Noelia Valencia Barrantes feels like she’s running in circles, doing everything at once: weaving traditional Peruvian sweaters and ponchos for sale, studying accounting at the university, and caring for her family at home. Traveling back to where she grew up, in a tiny village called Calapuja, time stands still for 400 residents whose daily life looks exactly the same, year in and year out. Anali returns once a month to attend meetings with her credit group (called “Calapuja” after the name of their village) and visit her grandma, Maria Elena. Thirteen members gather in Maria Elena’s grocery store, in the center of a small cluster of mud-brown adobe buildings that line a block-long main street flanking the Calapuja plaza. The most prominent building is the ubiquitous Catholic Church. Just across the plaza from the church sits Maria Elena’s shop, with its doors flung wide open to customers thirsty for Inca Cola (more popular here than Coke), snacks and other beverages. It’s like the local BevMo, except on the one afternoon a month when Anali and the other small-businesswomen take over the place. Resident of Calapuja Village in front of one of the main buildings on the plaza. Inside the shop, Maria Elena, her 74-year-old face deeply lined by the equatorial sun, counts change for a credit-group member buying a soda. Then she gives a cookie to a little girl hiding in her mother’s woven-wool skirts. As the women gather into a circle to open the meeting, the room with its dark cinderblock walls lit by a single dangling bulb lights up with their bright fabrics the colors of snap peas and plums, watermelon and lemon, swirling into place. 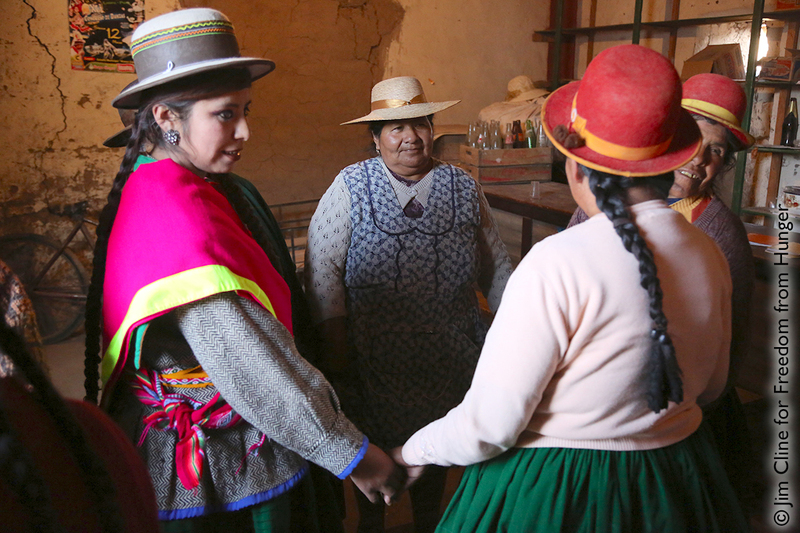 Anali, the youngest member, selects a “prayer card” from a deck and reads it aloud; then Maria Elena, the group president, begins the business of collecting interest and loan payments. They take attendance—you pay a fine from 36 cents to $7 for arriving late or missing a payment, unless you have a valid reason—and spend a lot of time carefully counting and recording the payments. Group members and field officer Tania (R), Note their credit group sign draped over the cases of soda. The group has been together five years. Anali learned from her grandma the craft of weaving naturally-dyed sheep’s-wool yarn into clothing, which is worn by locals and tourists alike. She uses her loans to finance materials needed for her business and to pay her college tuition. 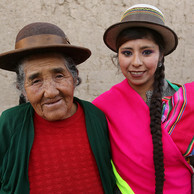 Now in her eighth semester, she’s about to graduate with a degree in accounting from the University of Andina in Juliaca.—Then Anali plans to create a large company to export woven products internationally. She’ll take what she learned from her abuela and the village far beyond their reach. Anali, outside her abuela’s shop. “I’m studying to be more than my grandma had a chance to be, and to have my life dependent on more than the weather,” Anali muses. Like many Calapuja residents and credit-group members, Maria Elena combines shop-keeping with cow and crop farming to aggregate a few dollars here and there into an income. “I want to learn technology,” Anali continues, “and all I need to know to grow my export business.” She intends to “employ many people, because it will be good for the people I employ and also for me.” Currently, she weaves both by hand and by machine, but her vision for her business in Juliaca involves large-scale production of apparel that’s shipped across Peru and Bolivia and around the world. Once she and her novio, 30-year-old Houston, can sock away enough savings, they will plan their wedding. “We’re Romeo and Juliet,” she sighs. “He’s a good man. I want to marry him as soon as we can.” Together, they envision owning their own home and having a happy family. As for their first daughter and the children yet to come, Anali thinks a lot about how to give them opportunities she never had. “I want to transfer my values so my children can work as hard as I do,” she says, but she also hopes they won’t have to juggle so much at one time as she’s managed to do. Anali records her loan payment and savings deposit in the group’s ledger. “I’d like my daughter to study as I do, but maybe at a better university, and to be able to do one thing at a time.—For me, I am working and going to school and taking care of family, all at once. I wish for her to be able to do one thing at a time and really focus.” Like the bus ride from the village to the big city, Anali forms a connection between the old traditions and new technology—both of which will enrich the lives of her children, far into the future, when her face is as lined as her grandma’s and her children have far surpassed her own accomplishments. The meeting ends with a song and a promise to keep their commitments to their businesses and one another.